A new prospective client has reached out, requesting to speak with you regarding a legal need. However, every new contact doesn’t turn into a new client, for a number of reasons. While you’ve got the basics of attorney call handling down, you find you are still spending too much time talking to potential clients who either aren’t the right person, don’t have the money to hire you, or simply aren’t ready to move forward yet. By properly qualifying leads, you can get a better idea of what a potential client is looking for before you ever get them into your office, if you decide they are right for you at all. Whether you are a personal injury attorney, business lawyer, divorce lawyer/family law firm, or any other niche, asking the right questions early on can help you determine if this is a client worth pursuing. Our attorney partners often struggle with callers who are looking for legal advice, rather than looking for actual legal assistance. There is no way we can keep these callers from reaching you, as they search the same way that an actual client searches. However, there is one quick and easy question you can ask to determine if the client is interested in retaining you as counsel. This one, simple little question does an amazing job of weeding out those who aren’t planning to give you any money. While there are many qualifying questions you will use throughout the conversation to determine if this case/client is right for your firm, we have found this single question to be most effective for providing relevant, useful information and insight into what the client is truly seeking from their conversation with you. Remember, the tone that you use is just as important as the words that you say. When asking someone if they plan to hire an attorney, make sure it is conversational and friendly, not accusatory. Your goal is not to berate or belittle someone who isn’t ready or doesn’t have the means to hire help at this time, but rather to determine if the time is right for both of you to move forward. Their Yes or No response will tell you a lot, but the context of that response will often tell you much more. A yes for them is not always a yes for you, and the opposite is also true. Law Firm: Thank you for calling Legal Beagles, this is Peppermint Patty, how can I assist you today? Caller: Hi, Patty. My name is Lucy and I have legal question I was hoping you could help me with. Law Firm: I’m sure we can help you out, Lucy. Are you planning to hire an attorney to assist you with this issue? Caller: Yes, I will be handling the arrangements and any fees, although it is actually for my son. He has been unable to see his daughter, my granddaughter, for the last 6 months, and we are worried about her well-being. My son was very young when his daughter was born, and I don’t know what his visitation rights are. I want to get some sort of agreement in place so we have scheduled time with her. Law Firm: Thank you for that information, Lucy, dealing with custody issues can be heartbreaking. You may not realize that grandparents may also pursue legal visitation rights for grandchildren, so both you and your son may have a legitimate case if you are being denied access. Our attorneys can determine the best course of action for you and your son starting with a Free Consultation. I can arrange an appointment time that will be convenient for both you and your son right away. Analysis: In this scenario, the client expressly states that they will be handling the fees, and have a legitimate need, potentially multiple cases and the opportunity for a long-term relationship. This one is definitely qualified and should be scheduled ASAP. Caller: Yes, I need an attorney right away. My boss says he is going to fire me for coming in late, but I have called every time to let him know I am running behind. I am a single mother, and my mom watches my daughter for me, but I have to wait until she gets off work to drop her off. I can’t afford to lose my job. Is there anything I can legally do to make sure I don’t? Law Firm: I’m sorry to hear this, Lucy, it sounds like this has been a real struggle for you. Since no action has been taken against you at this time, you may be a little early with seeking legal help. At this point, the best thing you can do is keep detailed notes and documentation of the situation, including notes from your conversations with your boss including when and where they occurred and who was present, as well as your own records of your timesheets, when you were late, and the time that you informed your boss of your delay. If you are let go from your job, and believe that you have been unfairly terminated, we will be happy to assist however we can at that time. Analysis: While this client stated that they were looking to hire an attorney, the details provided are enough to let us know that they don’t have a legitimate legal need at this time. We provide them with some helpful, general advice that will assist us if they do have a case down the road, and leave the relationship open-ended with an offer for future assistance. Hot Tip: Sometimes giving the potential client some homework can help to qualify them as well. If they aren’t willing to get you the information you need, they probably aren’t going to be motivated to pay you, either. Caller: Honestly, I’m not sure right now. I was injured while playing football at a local sports complex about 3 months ago and didn’t think it was that bad, but now my doctor says I may have to have surgery. Do you think I can sue the sports complex to help with my medical fees? Law Firm: Oh my, Lucy, it sounds like this has been a real struggle for you. Our attorneys would be able to determine if you do have a case during a free consultation. These types of cases can have time limitations, so we need to schedule something as soon as possible. Analysis: In this scenario, the client didn’t specifically commit to hiring an attorney, however they did indicate that they have a legitimate and personal need. This is enough for us to go ahead and offer the free consultation. Caller: Honestly, I’m not sure. My neighbor was having a party the other day, and I think my dog may was stolen by one of his guests. I put her out during the party, and when I went to call her back later that evening, she didn’t return. They are always causing trouble, and I just know that they took it. Law Firm: Oh no, Lucy, how heartbreaking! I don’t know that there is very much we can do for you at this stage. I would recommend reaching out to the authorities to report the potential theft, as well as contact your local humane society to keep an eye out for your dog. If you do find that your dog was stolen and would like to discuss potential legal recourse, we will be happy to assist you at that time. Analysis: This caller is clearly more upset about the lost dog and rowdy neighbors than any type of actual legal support, guidance, or assistance. They most likely do not have a legitimate legal need or claim, making it easy to disqualify them. Caller: No, I really just have some questions. I think that my husband and I are heading for a divorce. We have tried counseling, and things just don’t seem to be getting any better. I am worried about my kids, and really just want to talk to someone about what the process is like. Law Firm: I understand, Lucy. The idea of divorce can be scary, especially when you don’t know what to expect. The best thing for you to do would be to schedule a consultation with one of our attorneys. We can do a free phone consultation, or I can arrange a time in the office, whichever works best for you. They will explain the entire process, answer your questions, and let you know what you can do to make everything go more smoothly. Analysis: Although the caller says that she is not looking to hire an attorney, the story she tells us says otherwise. We can see that she is expecting divorce, and that there will most likely be child custody and other legal issues as well. Now is the time to move that relationship forward with a consultation. Caller: No, I just have a question. I got a new job in another city, but I still have 6 months left on my lease. Is there a way I can legally get out of it? Law Firm: Congratulations on the job, Lucy! Unfortunately, there isn’t a whole lot one of our attorneys would be able to do for you. There are legal protections for tenants, but it doesn’t sound like you are wanting to relocate due to the living conditions or the landlord’s inability to resolve serious issues. If you would like to hire an attorney to help you understand your lease and the law related to that, I can schedule an hour paid consultation with one of our landlord/tenant attorneys for a full review. Would you like to schedule that now? Analysis: This caller doesn’t have much of a leg to stand on, and most likely won’t require long-term service, especially since they are planning to relocate. However, this can be an easy way to get another paid hour, and provides a cost-efficient solution for the caller. Ask if they are planning to hire an attorney. Listen to their response to qualify or disqualify them. Be understanding and kind, whether qualified or not. Properly qualifying your leads allows you to focus your time, energy, and efforts where they will have the most impact on your firm’s success. As your firm grows, your qualifications may become tighter as you develop focus areas, or may expand as you add new attorneys or partners. Provide training for anyone in your firm who answers your phone, providing them with the tools and information they need to properly qualify and schedule new potential clients. 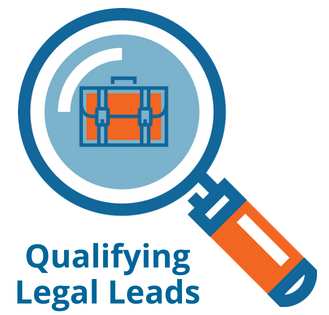 If you need help generating more qualified, targeted leads for your law firm, the legal marketing experts at Mark My Words Media are here for you. Want More Attorney Marketing Tips?